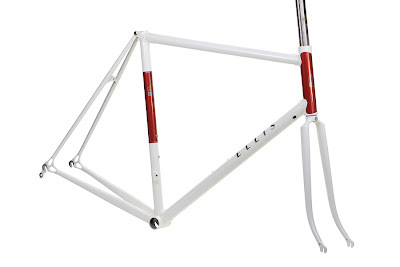 Glenn's frame, awaiting a full Di2 kit! He chose a really classic paint scheme, and it should be a nice counterpoint to the modern electronic parts. 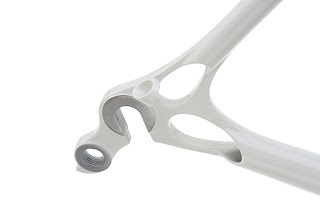 I love the look of the frame with no derailleur cable braze ons, it's super clean. I went with internal brake cable routing as well, to compliment the integrated Di2 wiring. 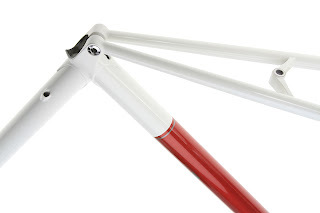 The dark red panel on the seat tube is set off by a thin silver pinstripe. 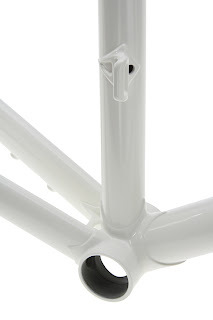 In this shot, you can see the exit hole for the front derailleur wiring, and the vent window in the bottom bracket where the battery wire will enter the frame. 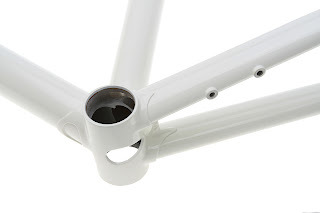 Stainless steel bosses for battery mounting, and the bottom bracket window. Finally, the Ellis dropouts with an added loop to keep the wiring out of the way for wheel changes.